Ask "Will you marry me?" 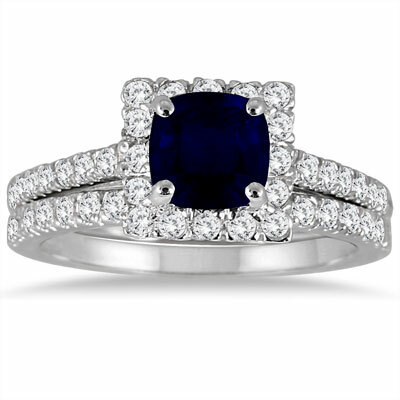 with this Cushion-Cut Genuine Sapphire and Diamond Halo Ring set. The luxurious 6mm, 1.5 carat sapphire has a unique and eye-catching design, destined to impress any bride. Encircled by 0.72 carats of round, I-J color and I1-I2 clarity, diamonds set in 14K white gold bands, the vivid blue sapphire will stand out against the vibrant diamonds like a vast ocean on your finger. The use of gemstones in engagement rings has been a historic tradition that has become widely popular again in recent years. This cushion-cut sapphire and diamond ring melds together a perfect fusion of vintage and modern. We guarantee our Cushion-Cut Genuine Sapphire and Diamond Halo Ring in 14K White Gold to be high quality, authentic jewelry, as described above.